There's a theory that I've been formulating for some time now. It's been festering in the back of my brain since shortly after the earthquake in India occurred on January 26. I've been biting my tongue and trying to keep it to myself, but recent events have made this impossible, and I feel that it must be laid on the table for all to see. You can form your own conclusions. Allen moved from New Hampshire to the San Francisco Bay Area in the late 1980s. And what happened on October 17, 1989? The Loma Prieta Earthquake! Where was Allen? Right smack in the middle of things! Much more recently, Allen was in Darjeeling for several days, as you read in Installments #20 and #21. He then made a bee-line all the way across the entire continentsome 1200 miles!and as soon as he got to Rajkot, what happened? The earthquake! Did it happen in Darjeeling? No! The epicenter was 50 miles from Allen Downs! And in between these two cataclysmic events, all during the entire time that Allen spent living on the West Coast of the US, there have been seismic rumblings on a daily basis! And many true earthquakes, both major and minor! It's not the San Andreas Faultit's Allen Downs's fault! And here's the clincher: In all the years since Allen left New Hampshire, that state has not suffered even one major earthquake! Not one! Coincidence, you say? I think not. The final straw, the event that has mandated that this exposé must come to light, occurred only last week. Just as Allen's plane was touching downjust as he was setting foot on US soil for the first time in five months!what happened? 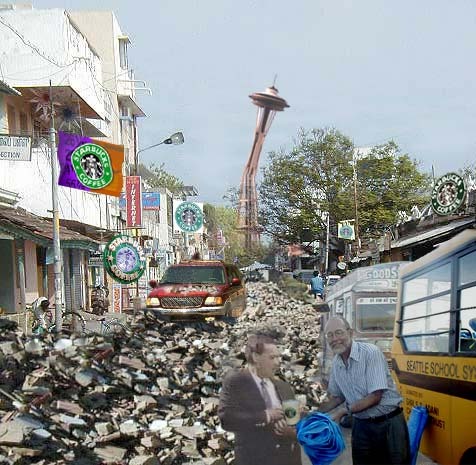 The Seattle earthquake! I rest my case! Allen is also the only person I know who can not float in a body of water no matter the salinity or what efforts are made. He sinks like a rock. (And he joined the Navy back in the '60s?) I attribute this to an extraordinary gravitational force that he exudes, which in all likelihood has something to do with the phenomenon under discussion. This warrants serious, detailed investigation. Please, if you know any scientists working in the field of seismology, make them aware of the catastrophic menace that lurks within Allen Downs. While it's true that he may have to be removed to a location where his powers of havoc won't matter (such as Cleveland), it will be for the good of all mankind. And Allen, we love you, but please don't come to visit any time soon.